This lease is designed for an office tenant who leases a small amount of square footage (i.e., 4,000 square feet) in a multi-tenant office building. The rent is stipulated in the lease, and is subject to annual increases. The tenant is responsible for its prorata share of operating costs for the building. (a) Landlord hereby leases to Tenant, and Tenant hereby leases from Landlord, for the term and subject to the terms and conditions hereinafter set forth, to each and all of which Landlord and Tenant hereby mutually agree, those certain premises (the “Premises”) generally shown on Exhibit A (site plan) attached hereto, which include approximately Four Thousand (4,000) Rentable square feet. The location of the Premises is commonly known as: _________________________ (“Building”). (b) In addition, the Premises shall include the appurtenant right to use, in common with others, the site, parking and landscaped areas. Landlord shall provide Tenant ___ non-reserved parking stalls per _________ Usable square feet of Premises in the adjacent parking lots of the Premises. (c) Acceptance of Premises. Unless otherwise notified by Tenant within thirty (30) days of taking possession, by entry hereunder Tenant accepts the Premises as being in the condition in which Landlord is obligated to deliver the Premises. Tenant shall at the end of the term and any extension herein surrender to Landlord the Premises and all alterations, additions and improvements thereto in the same condition as when received; ordinary wear and tear, damage by fire, earthquake, or act of God excepted. Landlord has no liability and has made no representation to alter, improve, repair, or paint the Premises or any part thereof, except as specified in Article 2(c), 2(d) and 6 herein. 2. TERM, OPTION, TENANT IMPROVEMENTS. (a) Lease Term. The initial Lease Term shall be ____ (__) years and is anticipated to commence __________ (“Commencement Date”). (b) Option. Provided that Tenant is not in default under the Lease, and not later than one hundred eighty (180) days prior to expiration of the Lease or any extension period herein, Tenant may by written notice to Landlord extend the Lease by exercising a 5 year option on a timely basis. Tenant shall possess the Premises during the option period upon the same terms and conditions of the Lease, except that Base Rent under Article 4(a) herein will be adjusted for the option period to the year 5 base rent rate plus 4%. During the option period Base Rent shall increase four percent (4%) annually for the remaining four years. (c) Base Building Improvements. Landlord has constructed and installed the Building’s roof and structural elements (“Shell”), provided basic utility access to and an initial HVAC unit for the Premises, and has construct the common areas of the Premises and Building, as more specifically outlined in Exhibit B - Base Building Improvements (collectively “Base Building Improvements”). (d) Tenant Improvements. Tenant accepts the premises in an “as is” condition at the execution of the Lease, except that the Landlord shall install missing floor base, repair walls as needed and repaint entire space, and repair, clean and shampoo carpets. Landlord will provide a wiring allowance of $_________ to upgrade the wiring within the suite. Wiring allowance will be applied by credit off sets to rent of $________ each in the months of ____________________. (e) Substantial Completion of Tenant Improvements. This section has been intentionally omitted. (f) First Right to Lease. Tenant is hereby granted the following right of first right to lease space in the __________ Business Park. If Tenant should desire additional space, Tenant shall notify Landlord in writing of the amount of space desired. Within ten (10) days Landlord shall advise what space is available meeting Tenant’s request and the fair market rental value of such space. (Landlord may exclude space which is not suitable or economic to modify or reduce in size to the area specified by Tenant.) Tenant shall, within five (5) days, give written notice if Tenant elects to take the additional space. Landlord and Tenant shall enter into a written lease, substantially in the form of this Lease, for the additional space, including rent increases annually Landlord, at its election, may require that the term of the lease on the new space coincide with the term of this Lease or on the date of increase under the Lease, at Landlord election. 3. NON-OCCUPANCY OF IMPROVED SPACE. In the event Tenant does not occupy the Premises and fails to pay Rents as required in Article 4 of the Lease, all Tenant Improvements become due and payable upon invoicing by Landlord. Further, such invoicing by Landlord does not waive any other rights or remedies Landlord may have against Tenant for failure to occupy. The Base Rent shall be payable in advance each month on or before the 1st day of each month during the duration of the Lease, with the first such monthly rental payment and security deposit (see section 33) being due upon the execution of the Lease. Any partial months shall be prorated accordingly. Base Rent will be increased (approximately 4% annually) during the Lease Term, as indicated in the schedule above, and during any Option period. All Base Rent and Additional Rent (collectively “Rents”) shall be paid as follows, unless otherwise directed in writing at the following address: ____________________. (b) Additional Rent. 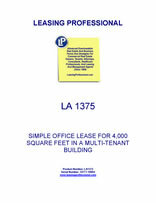 All obligations payable by Tenant under the Lease other than Base Rent are called “Additional Rent”. Unless otherwise provided, Additional Rent shall be paid with the next monthly installment of Base Rent upon invoicing from Landlord. (c) Interest, Late Charges, Costs and Attorney’s Fees. If Tenant fails to pay within five (5) days of the date due any Rents which Tenant is obligated to pay under the Lease, the unpaid amount shall bear interest at ten (10%) percent per annum. Tenant acknowledges that any late payments of Rents shall cause Landlord to lose the use of that money and incur costs and expenses not contemplated under the Lease, including without limitation administrative, collection and accounting costs, the exact amount of which is difficult to ascertain. Therefore, in addition to interest, any payments not received by Landlord within five (5) days from the date it is due, Tenant shall also pay Landlord a late charge equal to five (5%) percent of the late Rents. Further, as Additional Rent, Tenant shall be liable to Landlord for costs and attorney’s fees incurred as a result of late payments or non-payments. Acceptance of any interest, late charge, costs or attorneys’ fees shall not constitute a waiver of any default by Tenant nor prevent Landlord from exercising any other rights or remedies under the Lease or at law. (a) The Premises shall be used for general office purposes, and any other lawful purpose incidental to Tenant’s business, and no other, unless consented to in writing by Landlord. Tenant shall not do or permit to be done in or about the Premises or Building anything which is prohibited by or in any way in conflict with (in the case of hazardous materials, Tenant shall notify Landlord of any such materials and shall ensure that any such hazardous material is properly controlled, safeguarded, and disposed of) any and all laws, statutes, ordinances, rules and regulations now in force or which may hereafter be enacted or promulgated or which is prohibited by the standard form of fire insurance policy, or which will increase the existing rate of or affect any fire or other insurance upon the Premises or Building or any of its contents, or cause a cancellation of any insurance policy covering the Premises or Building or any part thereof or any of its contents. Tenant shall not do or permit anything to be done in or about the Premises or Building which will in any way violate Rules or Regulations reasonably promulgated by Landlord throughout the Lease, obstruct or interfere with the rights of other tenants, or injure them or use or allow the Premises or Building to be used for any improper, immoral, or unlawful purpose, nor shall Tenant cause, maintain or permit any nuisance, in, on or about the Premises of Building or commit or suffer to be committed any waste in, on or about the Premises or Building. (b) Tenant shall not use the name of the Building in which the Premises are located, in connection with any business carried on in said Premises (except as Tenant’s address) without written consent of Landlord. (c) Tenant shall not manufacture, assemble or store materials inside the common areas outside of Building. Landlord, at its sole expense, is only responsible to maintain the Shell and roof of the Premises and Building. All other operating services, including but not limited to repairs, maintenance, common area utilities, tenant utilities, common area janitorial, mutually-agreed tenant janitorial, sewer and garbage, insurance, taxes, and property management on the Premises, Building, and common areas shall be coordinated by Landlord, but are the financial responsibility of the Tenant through prorated Operating Expenses as more fully outlined in Article 7 herein.